Mark Hughes insists he did not find out he was going to be sacked as manager by Manchester City until after Saturday's thrilling 4-3 victory over Sunderland. Pre-match speculation suggested Hughes would be axed, while new boss Roberto Mancini was said to be in the crowd. "Notwithstanding media coverage to the contrary, I was given no forewarning as to the club's decision," said Hughes. "The speed with which my successor's appointment was announced suggests the club made its decision some time ago." 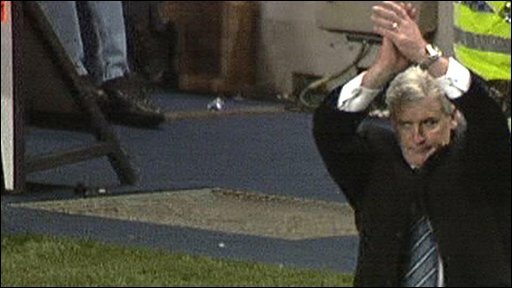 Many of Saturday's newspapers claimed Hughes was on his way out of Eastlands after 18 months in charge, and the 46-year-old Welshman cut a subdued figure on the touchline for most of an eventful game before waving to the fans after the final whistle. But the former Wales boss said he had not been informed about his future until after the final whistle. Hughes' statement - issued through the League Managers' Association (LMA) - echoed the claims earlier made by LMA boss Richard Bevan on Sunday's Sportsweek programme on BBC Radio 5 live. "I am extremely disappointed not to have been given the opportunity to see through my plans at the club," added Hughes. "At the beginning of the season, I sat down with the owners and it was agreed that a realistic target for the season would be sixth place in the Premier League, or in the region of 70 points. "All of this was communicated to the players and we all knew where we stood. While everyone at the club would obviously have wanted to see more wins, we were absolutely on target at the time of my dismissal. "I am very proud of the fact that I steered the club through the most significant period of change in its history." Hughes spent close to £200m on players during his 18-month reign, including a record-breaking British transfer fee of £32.4m on Robinho. Where is the common sense in sacking a manager before Christmas after giving him £200m to spend - and when he has delivered reasons for cautious optimism in both league and cup? "I have always been aware of the responsibility that comes with being afforded the luxury of a significant transfer budget, and I was grateful that the club supported me with significant investment in players," he said. "I very much regret, however, that I will not now be able to enjoy the success that would undoubtedly have followed in the light of that investment. "I believe that I have handled with dignity the recent pressure placed upon me by press speculation. "I would like to thank the fans for their support throughout my time at the club and particularly at this difficult time, and I wish the club every success in the future, particularly in relation to the forthcoming Carling Cup semi-final, their first semi-final for 28 years." Bevan, who was phoned by Hughes for advice on Saturday, said the former Wales boss did not deserve the treatment he had received. "I'm disappointed for Mark and the City fans - he would have delivered continued success if he and his staff had been afforded more time," added Bevan. "To me, his reputation is very much intact. They had only two defeats and he got them to the semi-finals of the Carling Cup." Hughes received support from several Premier League managers, with Tottenham boss Harry Redknapp expressing his surprise that Hughes was dismissed with his side in sixth place. "I couldn't believe it," Redknapp, whose side thrashed City 3-0 on Wednesday, told Sportsweek. "I'm disappointed. They've lost two games this season - away to Man United in the last minute and then they got beat at Tottenham in the week. "Two defeats is certainly not a disaster. They've got a game in hand and they were sitting just off the Champions League places. "I'm really surprised that they've taken that decision at this stage of the season. 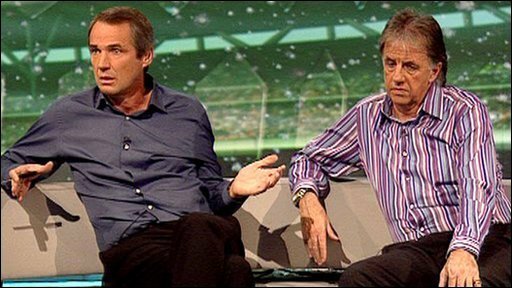 Mark's a good manager and, given time, there's not doubt they would have been very successful." Redknapp said the trend of ultra-rich overseas owners taking over at English clubs meant that the shelf life of most Premier League managers was destined to become shorter and shorter. "It's different now. You've got multi-millionaire owners who all want to be number one, and they're not going to understand that they can't all win," he said. "In their life, they've made so much money and they do what they want because they're so rich. "The more that come in, the more you are going to see managers come and go. The merry-go-round will be even worse because they're all disappointed they're not top of the league. They won't understand it." 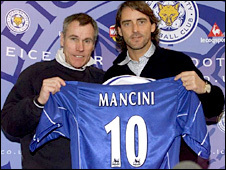 Mancini, who will take charge of City for the first time in their Boxing Day clash with Stoke, had a brief spell in English football with Leicester at the end of his playing career in 2001. He played only four games for the Foxes, but Peter Taylor, who signed Mancini in his spell as Leicester boss, said the former Italy star had shown managerial ambitions. "He's a lovely man and was always asking questions," said Taylor. "It was obvious that he wanted to become a manager and I'm sure he is going to be a very good one, but I am very surprised by the change (at City). "At the minute, they are sixth and I don't think that is bad progress for a new team. In a year, Mark might have got them where he wanted, but if you look at Mancini's record in Italy that is also outstanding." Mancini has managed Fiorentina and Inter Milan, where he won three successive Italian League titles and two Italian Cups, before being dismissed in May 2008. The 45-year-old, who won 36 caps for Italy as a striker, had been out of work since leaving Inter, where he was replaced by Jose Mourinho.